Welcome to the Synergy Billing Online Media Center. Here, you will find information about the latest developments at Synergy Billing and material that we hope you will find helpful. Our goal at Synergy Billing is to be the very best at what we do. Over the years we have built a reputation of excellence. We are obsessed with quality and customer service. In 2014 we introduced our quarterly newsletter: The Synergy Post. 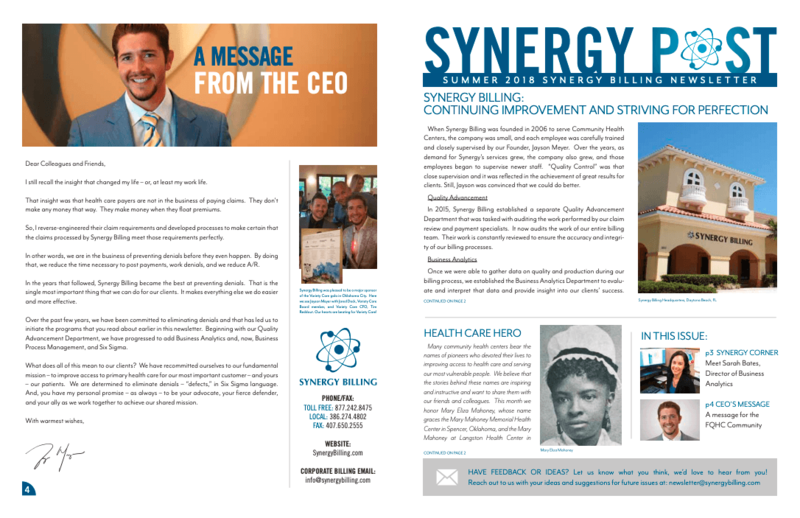 This newsletter is designed to keep you abreast of things going on at Synergy Billing as well as industry issues that may impact your health center and its financial performance. Click the image above to see our latest edition! GrowFL names Synergy Billing as one of 50 Florida companies to watch. Holly Hill approves lease for overflow capacity of Synergy Billing. CareerSource Flagler Volusia and Synergy Billing announce Synergy Career Ignite program. Synergy Billing named first place winner in Brighthouse Regional Business Awards. Synergy Billing on Inc. 5000 for second year in a row. Ranks number 767 with three year sales growth of 518%.